These young visionaries turned great ideas into multi-million-dollar businesses. The goal of most entrepreneurs is to make it big--after putting in a decade or two of sweat and sacrifice, and riding out a few bumpy patches before hopping on the gravy train. But some business owners come out of the gates running--hitting their stride before earning their first gray hairs. Timing, luck and hard work all play a role, but the business prodigies we profile all have one thing in common: Smart ideas. Meet four young pros with seven-digit revenues, and the road map to early success. 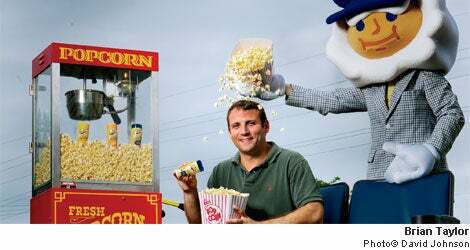 Location: Elk Grove Village, Ill.
Brian Taylor can thank his tired taste buds for his expanding popcorn-seasonings empire. As a student at the University of Michigan in 2000, the Chicago-area native was bored of snacking on butter-and-salt-flavored popcorn every night, so he copied down the ingredients in his favorite potato chip flavors and took a trip to the store to buy spices and cheese powders. Through trial and error, he came up with a hits-list of popcorn flavors. Word spread, and soon dozens of dorm-dwellers were knocking on his door asking for shakers of his barbecue or Parmesan blends. "My friends laugh when we remember the first time we packed up seasonings in my room," he says. "We used to fill 100 bottles by hand. We've grown a lot since then." Today, Taylor's Kernel Seasons low-calorie, no-fat popcorn seasonings are available in 70 percent of U.S. movie theaters and are sold in more than 30,000 supermarkets, including every Wal-Mart, Kmart, Target and Blockbuster Video. But that ramp-up didn't happen overnight. Realizing his hobby might be a viable business concept, the philosophy major shelled out $7,000 he'd saved from teaching tennis to hire flavor consultants to develop commercially scalable blends of his seasonings. After graduation, he moved in with his parents in Chicago's northern suburbs and became head spice mixer, chief marketer, accountant and salesman. That first year, he sold his mix to one movie theater. After years of steady growth, Kernel Seasons, based in a 31,000-square-foot, 41-employee facility in Elk Grove, now runs four production lines that produce 14 flavors. The company also recently started selling its brand of gourmet popping corn and movie-theater-style butter topping. Up next: Taylor plans to launch a line of drink mixes, seasoning blends for potatoes and pasta, and sweet blends for oatmeal, yogurt, cereal and toast. In 2003, the last time he released revenue figures, Kernel Seasons was bringing in $2 million. Since then, the company has grown roughly 50 percent per year. "The great thing about being an entrepreneur is that I'm not always at the office," he says. "Like my dad always said, 'I keep my office between my ears.'" Taylor and his wife, who had their first child in January, make time to travel, ski and golf. He's also working on an MBA from the University of Chicago and keeps a firm grip on his company. "I'm very focused on product development and sales and marketing," says Taylor, who doesn't see himself selling his business anytime soon. "I'm always on edge of discovering new products. But now I have the luxury of picking new paths for the company and leaving my ideas in the hands of others." There are two reactions to the typical Snorg Tee: immediate laughter or utter confusion. And that's all right. The T-shirt company based in the Atlanta suburbs has built its business around obscure movie and video-game references and visual puns. If you don't get it, you're not part of its demographic. 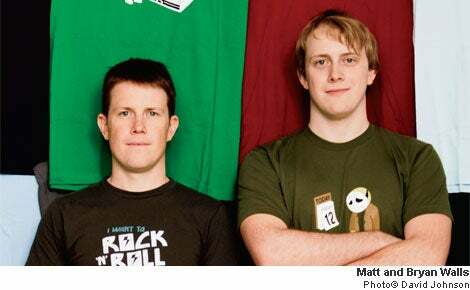 Snorg--a nonsense word--began in 2003 when brothers Matt and Bryan Walls decided to start a humor website. The site fizzled, but the brothers were left with dozens of funny T-shirt ideas they'd come up with during brainstorming sessions, so they decided to give apparel a try. In the beginning, Matt, who was working in IT, would come home from work and stay up till 2 a.m. managing their online business. "I initially thought it was going to blow up really fast, and we made some wrong assumptions about how well various marketing techniques would work," Walls says. "For instance, we figured we could buy a link on CollegeHumor for 200 bucks a day and that would send over 10,000 visitors. Surely 1 percent would buy something. But they definitely don't. We had some reality checks along the way." The company's first wave of success came in 2004 and 2005, with sayings based on the indie film hit Napoleon Dynamite. Once that craze died down, however, the brothers knew they needed to rethink the business, which was run out of Walls' basement. "When big boxes started selling similar shirts, we realized we didn't have anything else," he says. "We needed to expand our product offering, so in January 2006 I started working at Snorg full time and redesigned the website to be more user friendly." The extra attention paid off. Snorg now employs 10 people, contracts with 10 freelancers and has had a string of bestsellers--including the all-time favorite, "I'm Kind of a Big Deal." 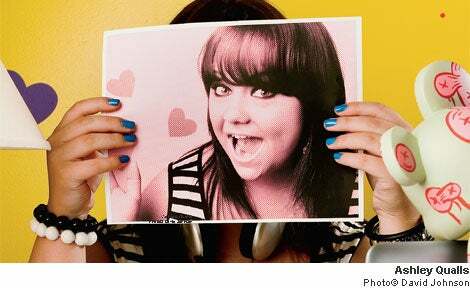 One of its models, Alice Fraasa, famous for her enormous smile, has become an internet icon. Walls now works mainly in marketing, while Bryan watches over production. Their father, a former Coca-Cola auditor, keeps an eye on the books, and everyone comes together twice a week to toss around new T-shirt ideas. Now that success is here (sales are between $5 million and $10 million), the Walls brothers are hoping to reap some of the benefits. "We got into such a work mode, and that's hard to change," Walls says. "Now that we're established, we should have a better standard of living. One of my goals this year is to work less." To that end, he and his brother have taken up wind surfing. "When the wind kicks up," Walls says, "you probably won't find us at the office." Ashley Qualls is an accidental entrepreneur. Her website, Whateverlife.com, which she set up in 2004, was created mainly as a way to share her custom MySpace.com templates with friends and family. But by 2005 her designs had been discovered by a legion of teenage girls who began decorating their web pages with her pink-and-pretty layouts. "It was always more of a hobby--I never intended to make a bunch of money off of it," Qualls says. "I really just enjoyed making designs and my audience felt that." That passion led Qualls--AshBo to her internet fans--to buy dedicated server space to host her site. A year later, she dropped out of high school at age 15 (though she later got her GED and an associate's degree) and began her web business in earnest. That meant cranking out 25 to 30 MySpace layouts per day and designs for any other application with customizable content. By 2006, Whateverlife was drawing as many as 375,000 visitors a day, and advertisers realized AshBo's site was their holy grail--an authentic web hub created by a teen for teens. At one point she was offered a $5 million payday. Instead, she made deals with direct advertisers and, among other things, used Whateverlife's teen clout to help launch the Jonas Brothers. Her success and frequent postings also led to a minor cult of celebrity around Qualls herself, who appeared on The View and at last count had 78,065 friends on MySpace. Today, Whateverlife has a staff of nine and is on the verge of a major transformation. As the market share of MySpace gets eaten away by the growing popularity of Facebook, which does not allow customizable layouts, Qualls has watched her traffic fall. (The site is bringing in about $30,000 a month in ad revenue, from a high of $70,000 a month.) So Qualls, who turned 19 in June, is morphing Whateverlife into the site she's always dreamed of--a social network focused on web design. Visitors can still grab designs for their sites, but designers can post their layouts for the public to critique and use, and newbies can log in to watch video tutorials on how to create their own layouts. "This is such big project where young people can learn and share designs and create," Qualls says. "The design world is so big and abundant. I hope other people see it like we do." To that end, Whateverlife is hiring its first full-time advertising rep instead of leaning on third-party ad clients, and hopes to snag 1 million widget views by the end of 2009 and 100 million in 2010. But the core of the site is still Ashley Qualls, who has funded the relaunch out of her own pocket and keeps her hand on the tiller. "All the creative control and overall design is still me," she says. "This company came from my heart, and as corny as it sounds, I want to grow it myself." In a life filled with numbers--gigabytes, unique visitors, dollars--there's one in particular that defines Jack Levin's life: 20. In 2005, when Google's IPO hit the NASDAQ, Levin, who was the tech behemoth's employee No. 20, hit it very, very big. But the Russian immigrant, who moved with his family to Missouri in 1991, wasn't ready to retire early. "I was only 30 at the time of the IPO, and it didn't make sense to sit and look at the clouds," he says. "I decided I'm going to do what I'm good at." So he left Google and took the reins of Imageshack, an image-hosting web service he and his brother Alexander dreamed up and developed in 2004. "At first when he told me about the project, I asked him, 'How are you going to make money if you're giving away space and bandwidth? It's so expensive,'" Levin says. "He said, 'I'll try and see what works,' and within a month, he had spent $80 and made $200. I figured if we could multiply this by 1,000 or 10,000, we would have a viable business." It turned out to be more than viable--Imageshack, which gets most of its revenue through targeted advertising, now employs 10 people and runs 600 servers. It gets 50 million unique visitors each month and more than 12 million page views a day. One estimate put sales at $56 million a year. But the company is also becoming a technology platform. In February, Levin launched Y-Frog, an application that uses Imageshack to allow Twitter users to add images to their posts. "I believe we've captured 90 to 95 percent of the mobile market already," Levin says. "Our software comes bundled with some of the most popular iPhone applications. If you've ever shared a photo on your phone, you've probably used us." Levin isn't in the business to make money. In fact, he says he's never taken a dime from Imageshack, which he and his brother own 80 percent of. 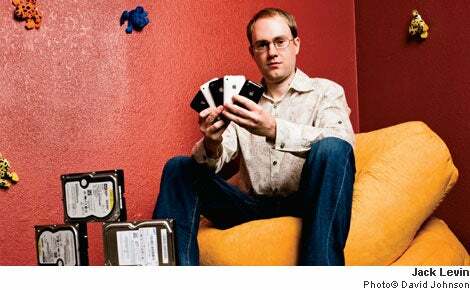 Instead, he hopes to build Imageshack into a company with the clout of Google or YouTube. His experience at Google, Levin says, gave him the skills to run a complex technology efficiently, with low overhead and minimal disruption. This helps him think about pushing Imageshack to a new level. "We can take big risks and be entrepreneurial. We can afford to fail, but we were set up to succeed from the get-go." At the same time, Levin isn't afraid to enjoy his success. "I certainly love running my business--it makes my day," he says. "But I'm definitely not a workaholic." "Unlike other people that might come to money, I'm not interested in celebrity status or being well-known," he says. "Enjoying my family and enjoying my kids are my No. 1 things." Jason Daley is a freelance writer based in madison, wis.